Give dinnertime a boost with this richly finished walnut dining table that can be transformed into a taller bistro version. 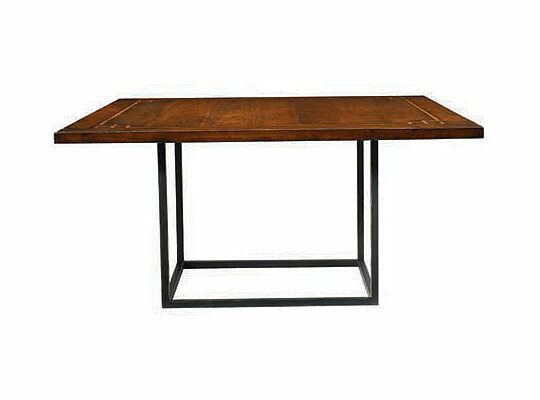 In contrast to the table’s very modern adaptability, its uneven hand-planed surface gives it a time-worn look, as does the boxwood veneer inlay, which evokes Old World craftsmanship. 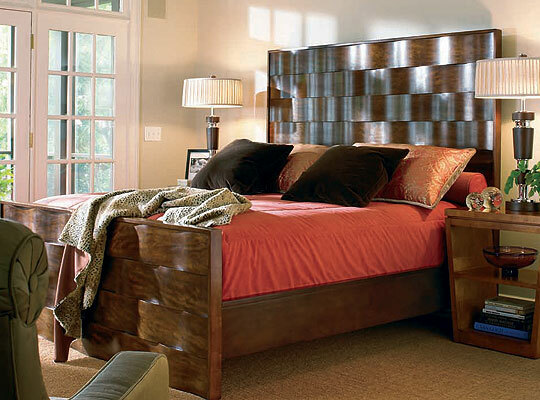 To create the undulating surfaces on this bed’s headboard and footboard designed by Century furniture, wood workers start with thick maple planks, they carve away sections using an innovative planing technique and then they covere it with veneers made of Avoidoire, a sustainably harvested exotic hardwood. The alternating dips and swells of the finished product create a sense of motion that evokes the rhythm of the sea. 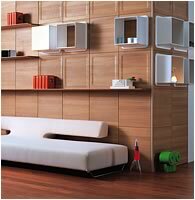 This ingenious update of wooden panelling offers the designer an easy to specify surface treatment for any wall.